March 2017, Rogue Cinema, Manchester: the masked, straw-festooned shamanic vagabond Lord Mongo and new-fangled three-piece band Tuskmoth (Lord Mongo, Dave Bez, Otis Jordan) performed live music to cinematic visuals by Film Material artist Nick Jordan, assembled from the artist’s recent film works that feature Lord Mongo’s soundtrack scores; including excerpts from Jordan’s new film Thought Broadcasting (2017), plus The Rising (2014), The Atom Station (2015), and MERZMONGO (2016) – which was originally made for ‘100 Years of Dada: Film is Dead, Long Live Dada’ (ICA, London) and performed live at Supernormal Festival 2016. Film Material was delighted to be invited to take up ‘residence’ in the all new Vortex stage at Supernormal Festival, Aug 5th – 7th, 2016, presenting expanded filmic performances, screenings and projections that animated the space throughout the weekend. We were pleased to feature work by artists Mary Stark, Nick Jordan, Lord Mongo, David Chatton Barker and Sam McLoughlin, plus screenings from Chris Paul Daniels, Clara Casian, Joe Duffy, Dave Griffiths, and a short film programme curated by Nick Jordan (Back Roads to Far Places). Kicking off proceedings on the Friday night was Lord Mongo, with The Slate Pipe Banjo Draggers, presenting an improvised electronic and vocal performance to the expanded version of Nick Jordan’s film MERZMONGO (2016), originally made for ‘Film is Dead, Long Live Dada’ festival at the ICA. Featuring stream-of-consciousness vocals, Babylonian masks, and one forlorn, masticated, bug-eyed ferret marionette, the stupefying/electrifying Lord Mongo kicked off the residency with wild and deranged abandon. Following Lord Mongo, Mary Stark & David Chatton Barker’s 16mm performance encompassed three separate works: ‘Boing’ – springs sourced from abandoned film projectors transform into 16mm photograms with optical sound and live spriinngggg action. Then ‘Solar Spell’ – saluting the sun through fogged and scorched film with optical sound, pre-arranged soundscape and live lens based light play. Finally, ‘Bread’ – a filmic ritual giving thanks to tactile magic and domestic alchemy, the craft of making bread. Premiering at Supernormal, the 16mm performances were made only this year at Film Farm in Ontario, Canada, and were shown at Film Farm as well as at CineCycle in Toronto. On Saturday, following film screenings from Film Material artists Chris Paul Daniels, Clara Casian, and Dave Griffiths, Mary Stark’s ‘Film as Fabric’ performance summoned the obsolete industries through 16mm film projection with optical sound, mechanical noise and sounds associated with the production of cloth. Incorporating audience participation and live stitching into 16mm film stock, the work made great use of the dramatic, triangular Vortex space, with multiple projections and light. Following Sunday’s screening of experimental short film programme, Back Roads to Far Places, curated by Nick Jordan, collaborative duo David Chatton Barker and Sam McLoughlin enacted their ‘Cognitive liberation happenings and ritual instruments’ performance. A mysterious, exploratory, alchemical, visual and sonic transformation of everyday objects, rudimentary electronics, instruments and natural elements. A programme of experimental short films selected by artist Nick Jordan, featuring work by Jaimz & Karen Asmundson; Ulu Braun; Mark Chapman; Jamille Fortunato; Juliane Jaschnow & Stefanie Schroeder; Mischa Leinkauf, Lutz Henke & Matthias Wermke. Rooted in a documentary approach, the programme features an eclectic selection films that have screened recently at major international film festivals, such as Berlinale, Kurzfilmtage Winterthur, Clermont-Ferrand and Sao Paulo International Short Film Festival. The films range from an esoteric, collaged, architectural fable; a strident protest against tree planting; a subjective roam through the post-industrial former East German landscape; a mystifying intervention on the Brooklyn Bridge; the hidden, inner world of a homeless hostel; and a child’s imaginary film and make-believe games, played-out in the backyards of an indigenous Brazilian village. The programme is titled after Lawrence Ferlinghetti’s single long poem of inter-connected verses and drawings. The programme previously screened throughout the weekend of Aug 5 to 7, Supernormal Festival, Oxfordshire, UK. Saluting the sun through fogged, scorched and solarised 16mm film with optical sound and live lens interventions. David Chatton Barker & Sam McLoughlin: Cognitive liberation happenings and ritual instruments. 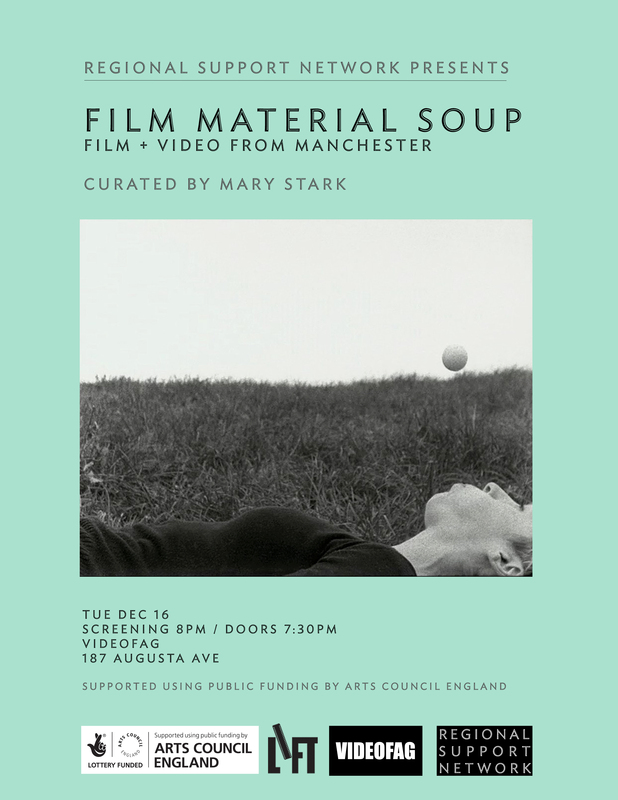 Mary Stark: Film as Fabric. A film performance with optical sound summoning obsolete industries through 16mm film projection, shadow play, mechanical noise and sounds associated with the production of cloth. SUPERNORMAL is a three-day, experimental arts and music festival taking place at Braziers Park in Oxfordshire. It offers a platform for artists, performers and musicians to work collaboratively and creatively for a new kind of audience seeking experiences out of the mainstream. It is determinedly small and intimate with an audience of 1,500 and has been born from a place that values the currency of ideas and imagination rather than commercialism and profit. Following a week long residency in September 2015, with Manchester’s FILM MATERIAL visiting BEEF in Bristol, this year three artists from Bristol Experimental and Expanded Film (BEEF) took part in a micro-residency with FILM MATERIAL in Manchester from 11 to 15 April. Matt Davies, Laura Phillips and Alexander Stevenson were based in Rogue Project Space before it opened for an event on Friday 15 April with film installation, performance and screenings from Matt, Laura and Alex, as well as Vicky Smith and Film Material’s Mary Stark. Matt Davies showed a three projector 16mm film performance using film loops and sounds created from recording the transformers inside film projectors. Imagery included found macro footage of plants photosynthesising and at one point he burned film live in the projector. Alexander Stevenson showed a 16mm film interpreting The Mechanical and Chemical Processes of 16mm Film though dance. During his time in Manchester, Alex worked on a foley soundtrack to accompany the film before showing it for the first time at the event on Friday. Laura Phillips installed a 16mm cyanotype loop made by exposing filmstrips with fabric in windows around Rogue Studios. Threading across the ceiling, the installation held a sculptural presence in the event space. BEEF screened a 16mm film by Vicky Smith made by a bike being ridden along and across a length of clear film leader. Mary Stark tested out new developments of a 16mm film performance, Film as Fabric, before showing it at Sound is Sound is Sound at The Albany in Deptford the following night. She experimented with new developments involving the audience being measured with film. Thanks to John Lynch of Manifest for these excellent photos documenting the performance. During the week Film Material and BEEF also held an artist show and tell evening to share their practices. It was a pleasure to host the artists from BEEF, with this exchange marking the beginning of fruitful filmic relationships between artist filmmakers from Manchester and Bristol. Look out for more information about upcoming events at BEEF and with Film Material in Manchester as the two collectives forge further communal cinematic creations! Members of FILM MATERIAL visited BEEF (Bristol Experimental and Expanded Film) during September 2015 for a week-long residency and public event. We’re pleased and excited to host a return residency for BEEF artists, along with a performance of expanded film installation on Friday 15 April. Featuring: Matt Davies (Expo Leeds/ Kitev Oberhausen / Spike Island / Schmalfilmtage Dresden), Laura Phillips (Cortoformo / Annexinema / Spike Island / KARST, Marcy Saude (IFF Rotterdam / Ann Arbor FF / Other Cinema San Fransisco / Filmwerkplaats), Vicky Smith (Alchemy FF / London SFF / Arnolfini / Tate Britain / London Film Makers Co-Op), Alexander Stevenson (KARST / Bristol Biennial / GoMA / Grand Union). This event is part of Rogue21 series in 2016 – celebrating 21 years of Rogue Studios in Manchester. Site-specific film performance by Mary Stark exploring voice, optical sound and industrial noise, featuring works made during her September 2014 residency at the Liaison of Independent Filmmakers of Toronto. Since 2012 Mary has worked with the filmmaking technology of optical sound, deriving ‘voices’ from fabric, lace and thread. Optical sound involves visual forms in the soundtrack area of the filmstrip translating into sound through film projection. This performance develops these explorations by engaging with the industrial heritage of Manchester in an atmospheric location, summoning absent voices, obsolete machinery and ghosts of industries past. Works involve live performance, 16mm film projection, sculptural light and shadow play, voice, industrial noise and music associated with the textile industry. Images © Ralph Pritchard, John Lynch & Mary Stark. Videofag is a storefront cinema and performance lab in Toronto’s Kensington market dedicated to the creation and exhibition of video, film, new media, and live art. Another seasonal show-and-tell, of international photographic adventures. Ahead of his CFCCA show, Chris Paul Daniels test-screened his latest twin-screen video, A Tiger’s Skin. Shot during his journey with Transnational Dialogues Chinese Caravan 2014, to Hong Kong and five Chinese cities, Chris’ film is a contemporary echo of Chung Kuo, Cina. Revisiting similar locations to Antonioni’s 1972 feature, and reframing aspects of China’s economic, cultural and recreational daily life, Chris’s work highlights how documentary assumes authenticity, and the how the filmmaker struggles to speak about otherness. It’s also a subtle study of the photographic as a regime possibly more powerful than nation-states and broader geopolitical structures. In another Asian project, Dave Griffiths reported on his and Joe Duffy’s field trip to Ordos-Kangbashi ghost city in 2013, and his recently completed commission for Full Circle Arts. The plain our bed the stars our blanket is a Google API hack, hosting Dave’s dense, navigable photo-collages of various locations in a depopulated mining mega-city of Inner Mongolia. Featuring pit heads, power stations, migrant workers, leisure zones and failing real-estate projects, his microfiche and online work documents a brief extinction event, the GDP-driven life and death of Xanadu. Jo Byrne presented her poetic, acutely observed stills photographed during a visit to the redundant Coney Island resort of lower Brooklyn. In her depictions of the uncanny, of broken freakshow attractions and seaside surrealism, we were again reminded of photography’s potential for weird anthropology within the fractured remains. Film Material Soup are pleased to present a double-programme with LUX13 Critical Forum, 15 artists working with the moving-image who in May 2013 formed a monthly discussion group at LUX for artists no longer in education. At each meeting two members presented their practice, discussing work-in-progress, sharing texts, considering broader theoretical ideas, and viewing works from the LUX archive. Continuing the group’s process of discursive exchange, each artist has made a work no longer than three minutes in response to a word or phrase provided by another group member.